1. Preheat the oven to 200ºC, gas mark 6. Heat the oil in a large frying pan and fry the leeks and potatoes for 5 minutes, then season and transfer to an ovenproof dish. Top with the coley and bake for 20–25 minutes until the fish is cooked through. 2. Meanwhile, blend the watercress and quark in a food processor until smooth, then season. 3. Remove the coley and stir half the watercress mixture into the leeks. 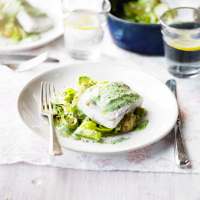 Serve the leeks topped with the coley with a spoonful of the remaining watercress mixture.